Nature’s Blossoms’ soy candle making kit was designed to help you to easily create your first candles while getting the highest quality results. 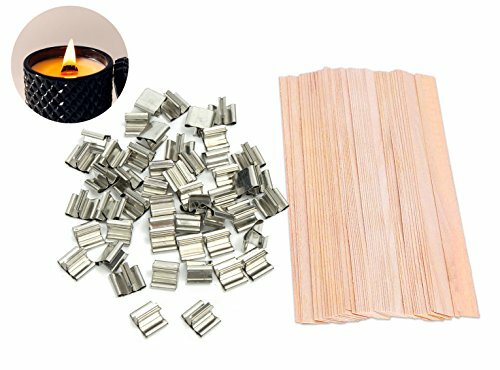 This kit comes fully studded with a complete set of tools and accessories needed to make 3 premium scented candles. 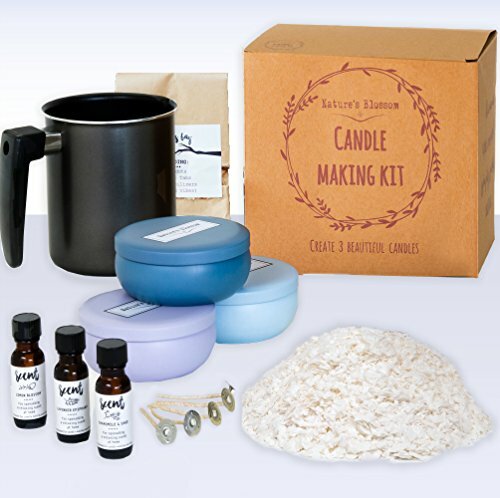 This kit is designed to make candle making process as simple as it can be, all year long. Try out new hobbies and get started with your first candle making experience! And if you are looking for THE 2017 holidays gift – this kit makes a perfect DIY gift for arts and crafts enthusiasts! EVERYTHING YOU NEED TO EASILY MAKE THREE LARGE SOY CANDLES. Nature’s Blossom’s soy candle making kit contains ALL the supplies needed to create your first candles: 1.5 lbs Natural vegetable soy wax, 3 bottles of candle fragrances (Lemon, Lavender & Chamomile) ; wax melting pitcher ; Cotton wicks & stabilizing accessories ; 3 large tin candle containers with lids (8 oz. Each) + a step-by-step candle making guide. Each candle has a burn time of approximately 20 hours. FRIENDLY INTRODUCTION TO THE EXCITING WORLD OF CANDLE MAKING. Designed for beginners, we made sure to include a detailed instruction manual so your first candles will look, burn & smell just like those luxury candles from your favorite candle brands. 100% SATISFACTION POLICY – if there is ANYTHING wrong with your kit, please contact us we’ll resolve any problem immediately. 3 PREMIUM GRADE SCENTS Crafted by an amazing scent maker right here in the USA. The kit arrives with 3 natural candle fragrances: LEMON BLOSSOM – A warm blend of ginger & lavender are melded with bergamot & smooth violet all combined with the delicate lemon blossom ; LAVENDER EPIPHANY – Delicate scents of relaxing lavender, comforting lilac & healing aromatic mimosa ; SOOTHING CHAMOMILE – A distressing Chamomile melds perfectly with grounding Sage creates a relaxing herbal fragrance. 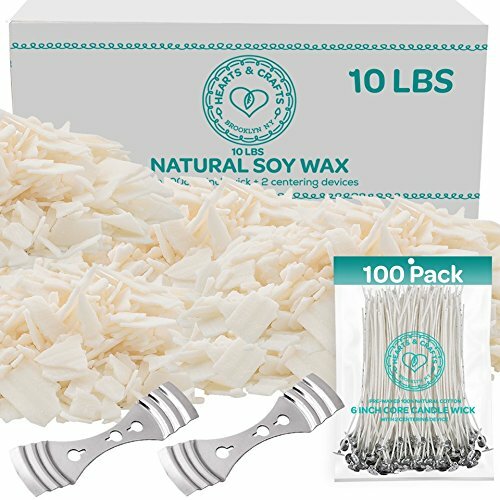 1.5 POUNDS OF 100% NATURAL VEGETABLE SOY WAX FLAKES. Soy wax is trending hot, and there is a great reason for it. It burns slowly and evenly (each candle will last more than 20 hours of burn time), it is relaxing and calming, and it spreads the candle’s fragrances like no other wax. Melting the vegetable soy wax is simple, using the included 2 POUNDS WAX MELTING PITCHER, which is made with aluminium construction, and designed with easy-pour spout and heat resistant handle. FUN & ORIGINAL GIFT. Why get them another gift when you can give them a new hobby instead. 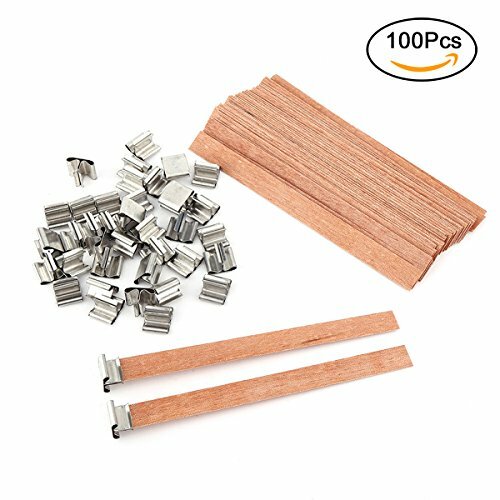 This set is a popular gift choice for the upcoming holiday season, as it is a fun and original gift that everybody enjoys. They will enjoy the making process and see the fruits of their creation when they will light up their hand-made aromatic candles that will spread relaxing scents across their homes. This kit is a great DIY Christmas gift idea for arts & crafts fans, men, women and children.